How much can drivers earn per hour? On average drivers earn $11 per order. That includes the delivery fee and tip. Drivers that schedule themselves for at least 10 hours/week average ~1.6 orders per hour. This is only an average and varies depending on individual driver performance. Do I have to schedule myself to take deliveries? Yes. Every Saturday at 10am Jolt releases the schedule for the week. Jolt drivers can sign themselves up for any openings through the scheduling app When I Work. These time blocks range from 2 to 5 hours in length. When you schedule yourself, you are committing to the full block of time. E.g., if your block begins at 11am and ends at 3pm, you are expected to be available to take orders the entire time. Can I drive on another platform while working with Jolt? Absolutely! We encourage drivers to work wherever they like. However, if you do schedule yourself for a block of time with Jolt, our expectation is that you will only take Jolt orders during that time. Why? Unlike other platforms, we limit the number of drivers on the road to match the expected number of deliveries. This ensures that the drivers scheduled stay busy. But also means, we need their full attention to complete all orders. What is the delivery area? At this moment our service is only available in Los Angeles. What types of orders do Jolt drivers deliver? Most deliveries are On-Demand (under $150 and ready for immediate pickup). 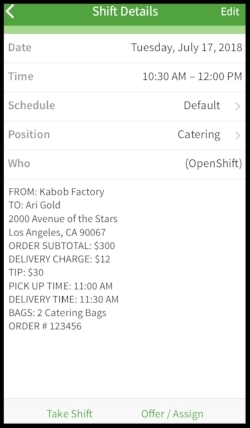 Qualified drivers can also take Catering Orders (between $150 - $1,000 that require exact drop-off times). Catering Orders charge higher delivery fees because they require higher touch and precision. How do I qualify for catering orders? Drivers that complete 100 On-Demand orders AND have proven to be reliable and professional, are eligible to take Catering Orders. In addition, drivers that schedule at least 15 hours between Friday and Sunday can qualify for Priority Catering which allows them to be notified of catering orders before the rest of the catering pool. Do Jolt drivers wear uniforms? No. Drivers are not required to wear uniforms. However, we do recommend drivers appear clean and presentable. Drivers who look and act professionally generally earn better tips! Do I have to use Jolt Delivery bags? No, but drivers do need at least one catering size bag and one pizza bag. If you wish to use our bags, there is a $75 bag deposit (for both bags) that gets deducted from your first paycheck. At any time you can return the bags (in good condition) to receive your deposit back. What apps do I have to use in order to drive on your platform? Voxer - A walkie-talkie like app used to chat with dispatchers and our support team. Drivers are paid every Friday via direct deposit for the prior week’s deliveries. On Monday nights, drivers receive an email with a summary of every delivery they have completed from the prior week. How do Guaranteed Blocks work? On When I Work, some blocks list a guarantee. This means, between delivery fees and tips, you are guaranteed to make at least that amount during the block. Most drivers exceed this amount, but if you do not Jolt will manually add the remainder to your weekly payout. To qualify for this guarantee, you must be available during the entire block and not decline any delivery requests.